The future of a Letterkenny pre-school has been secured. 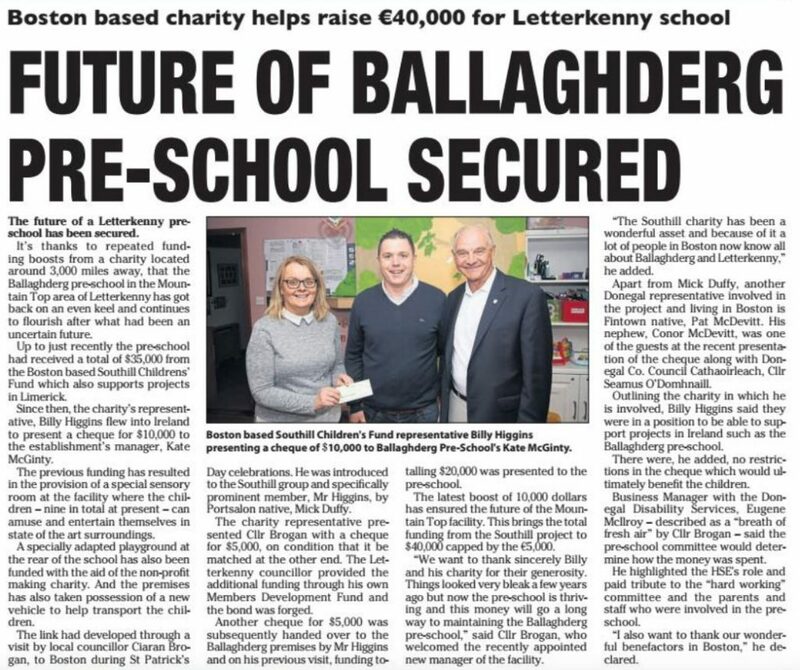 It’s thanks to repeated fund-ing boosts from a charity located around 3000 miles away, that the Ballaghderg pre-school in the Moun-tain Top area of Letterkenny has got back on an even keel and continues to flourish after what had been an uncertain future. 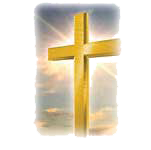 Up to just recently the preschool had received a total of S… from the Boston based South. Childrens’ Fund which also supports projects in Limerick. Since then, the charity’s represent-alive. Billy Higgins flew into Ireland to present a cheque for $10,000 to the establishment’s manager. Kate McGinty. The previous funding has resulted in the provision of a special sensory room at the facility where the children — nine in total at present — can amuse and entertain themselves in state of the art surroundings. A specially adapted playground at the rear of the school has also been funded with the aid of the non-profit making charity. And the premises has also taken possession of a new vehicle to help transport the children. The link had developed through a visit by local councillor Ciaran Brogan, to Boston during St Patrick’s Day celebrations. He was introduced to the Southill group and specifically prominent member, Mr Higgins, by Portsalon native, Mick Duffy. Boston based Southill Children’s Fund representative Billy Higgins presenting a cheque of 10,000 to Ballaghderg Pre-School’s Kate McGinty. The charity representative pre-sented Cllr Brogan with a cheque for 55,000 on condition that it be matched at the other end. The Letterkenny councillor provided the additional funding through his own Members Development Fund and the bond was forged. 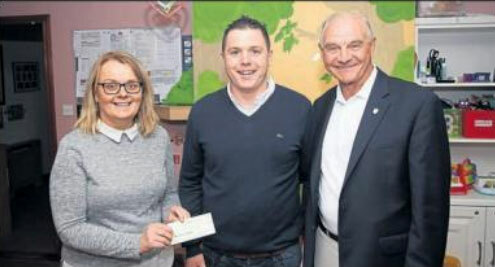 Another cheque for 5,000 was subsequently handed over to the Ballaghderg premises by Mr Higgins and on his previous visit, funding totalling, $20,000 was presented to the pre-school. The latest boost of 10,000 dollars has ensured the future of the Mountain Top facility. This brings the total funding from Southill Project to $40,000 capped by €5,000. “We want to thank sincerely Billy and his charity for their generosity. Things looked very bleak a few years ago but now the preschool is thriving and this money will go a long way to maintaining the Ballaghderg pre-school,” said Cllr Brogan. who welcomed the recently appointed new manager of the facility. “The Southill charity has been a wonderful asset and because of it a lot of people in Boston now know all about Ballaghderg and Letterkenny.” he added. Apart from Mick Duffy, another Donegal representative involved in the project and living in Boston is Fintown native, Pat McDevitt. His nephew, Conor McDevitt, was one of the guests at the recent presentation of the cheque along with Donegal Co. Council Cathaoirleach, Cllr Seam. O’Domhnaill. Otttlining the charity in which he is involved. Billy Higgins said they were in a position to be able to sup-port projects in Ireland such as the Ballaghderg pre-school. There were, he added, no restrictions in the cheque which would ultimately benefit the children. Business Manager with the Donegal Disability Services. Eugene Mcdroy — described as a “breath of fresh air” by Cllr Brogan — said the pre-school committee would determine how the money was spent. He highlighted the HSEs role and paid tribute to the “hard working” committee and the parents and staff who were involved in the pre-school. “I also want to thank our wonder-ful benefactors in Boston.” he declared.